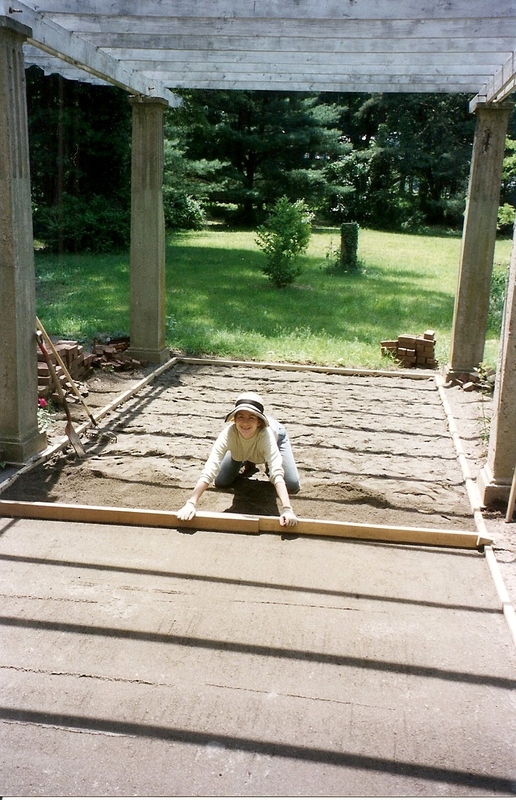 Before I moved to France I worked as a gardener for Halsted Wells and Associates while going to school for Garden Design at the New York Botanical Gardens. I was fortunate to have been trained by one of the leading Horticulturalists in the business; Karl Mckoy. 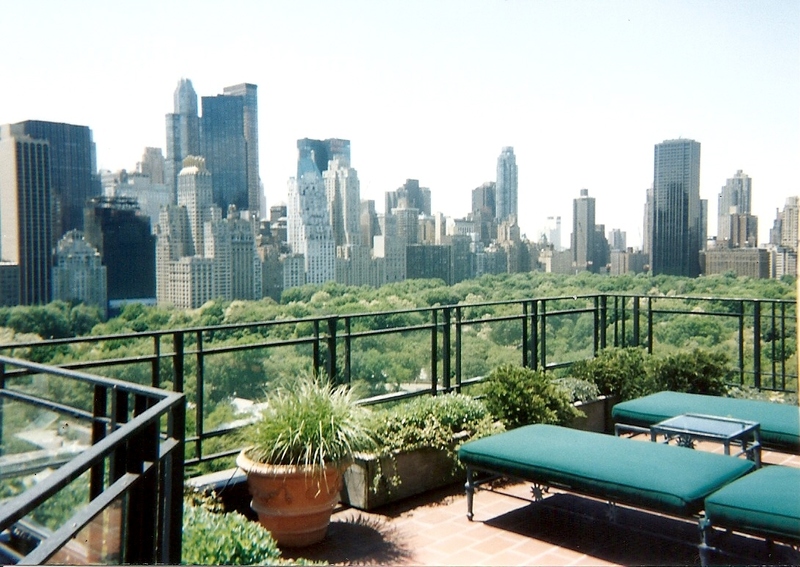 We worked on some of the most beautiful gardens in the sky that Manhattan had to offer. 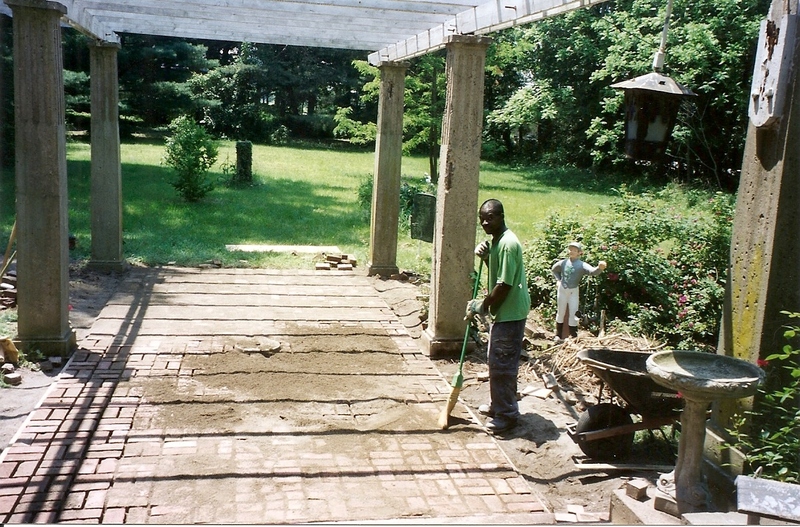 Right before I moved away, I wanted to accomplish one of my life long dreams; restore my country house brick patio. 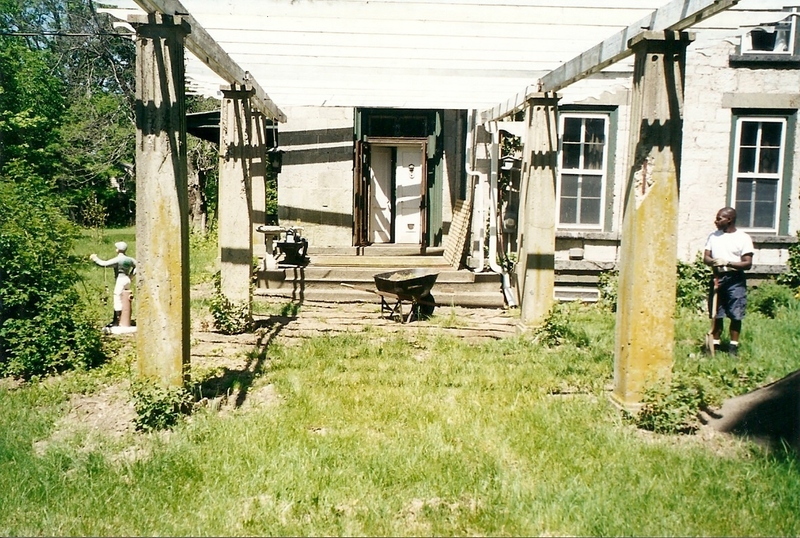 I always knew that this area underneath the arbor had the potential of being a splendid entrance way for the house. 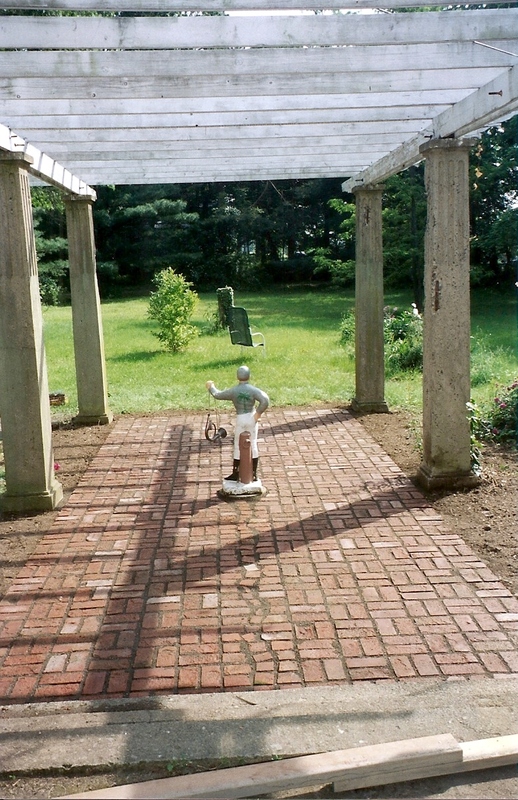 The brick patio underneath the grass had been covered for years. First we planted Blaze climbing roses in front of each pillar. In order to have an arbor full of roses, I needed a hardy rose that would be able to survive upstate New York freezing temperatures. 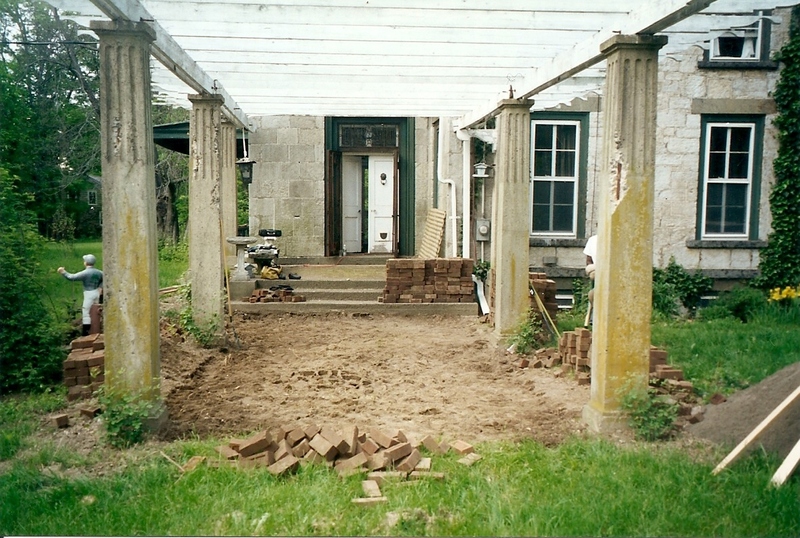 Removing the grass and all of the existing bricks was the easy part. 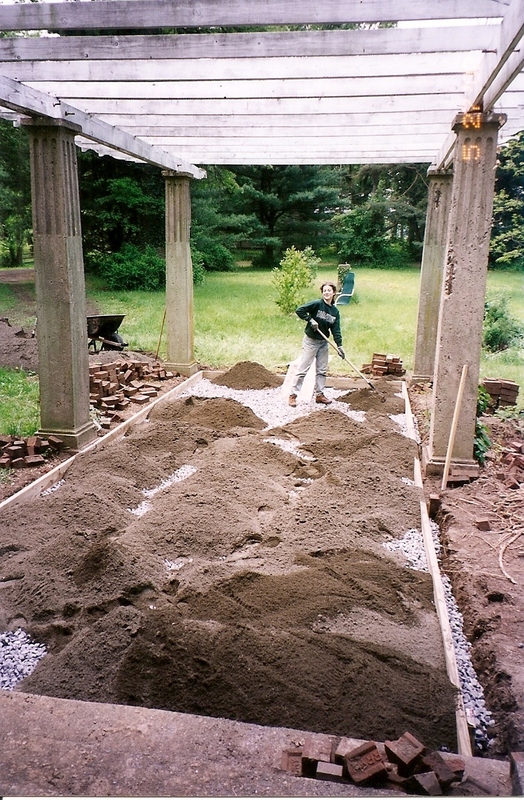 Step 2 – Digging Down 1 Foot Across the Entire Surface area. Once we got started digging we had to remove a lot of old roots, and tools that we found. Such as Wisteria roots mistakenly planted in open ground. 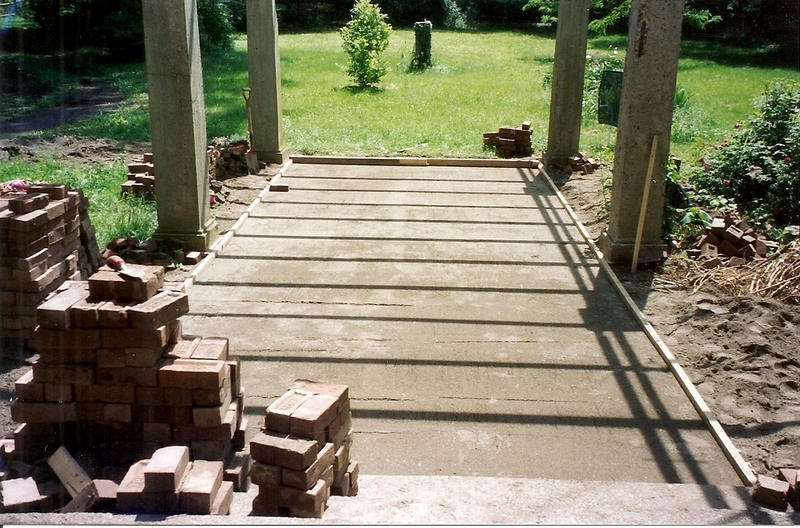 Patios of all types need a frame to help keep the sand and gravel materials in place. 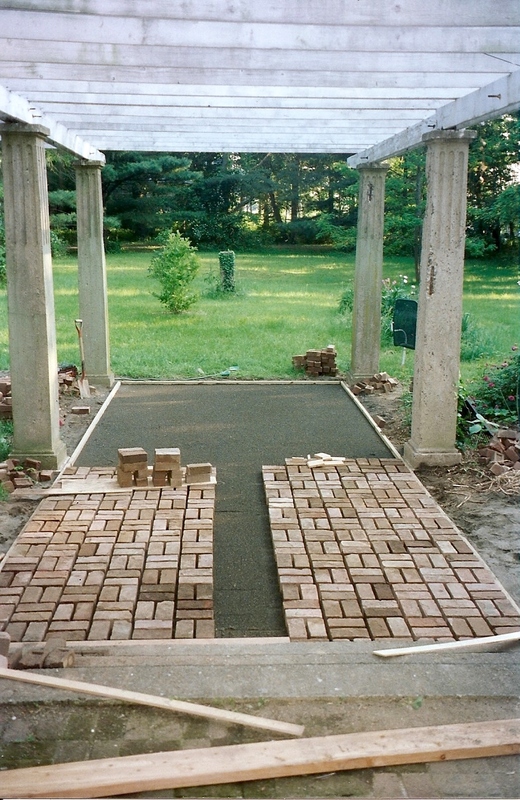 Before pavers are added; a wood framed patio also assists with leveling. Laying down a layer of garden fabric is recommended, but not required. 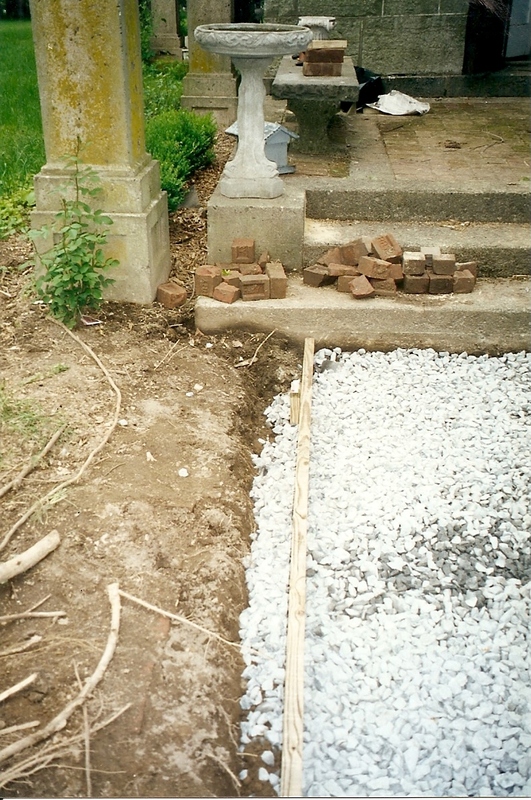 It is useful to help keep the stones separated from ground layers. 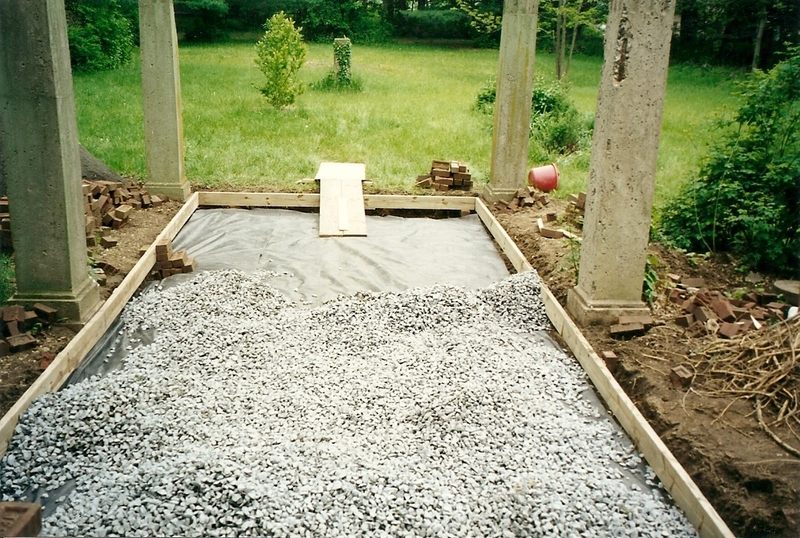 We put down 2 – 3 inches of stones on top of the garden fabric. We spread out 2 – 3 inches on sand on top of the stones. 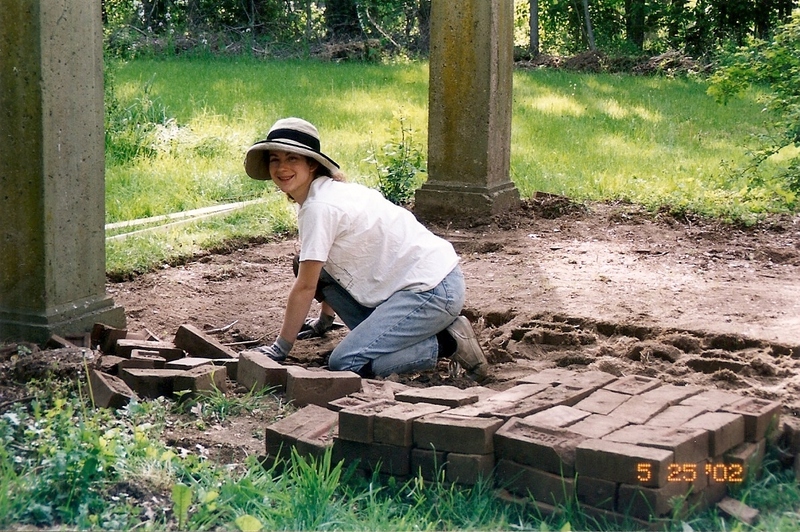 Once the sand was spread out, it needed to be leveled properly in order for us to lay out the bricks. With spare wood, Karl made a leveling device with cut edges so that it could be easily glided along the wood frame. This process took longer than we expected. It was necessary to fill in any air pockets that accumulated, the more compact the sand bed is the better. We decided on the traditional basket weave pattern for the patio, with a column in the middle for all the broken bricks we dug up. Another very time consuming task was filling in the gaps with sand. 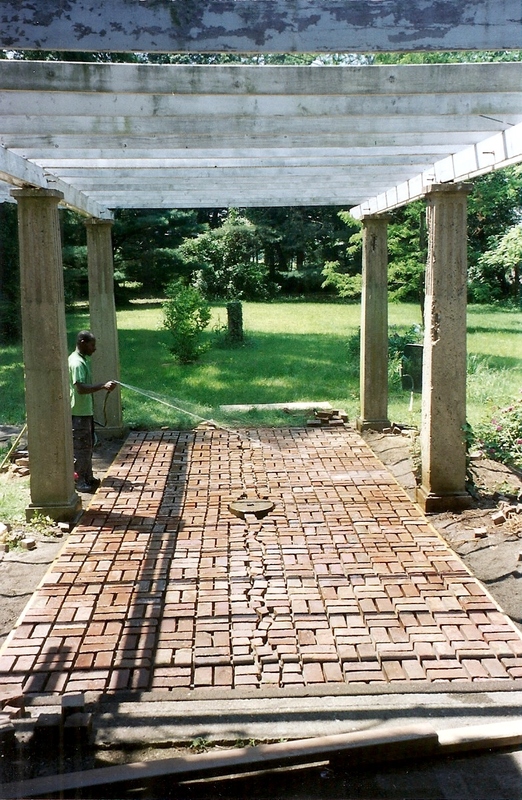 Each brick needed to be carefully swept in order to spread the sand, paying attention not to move the brick out of place. After sweeping all the sand we could in between each brick, we hosed down the entire patio with water to allow the sand to settle. After letting the sand settle a bit, we added another 1 – 2 inches of sand in between each brick across the entire surface area. Karl and I accomplished this project in two weekends (including Memorial Day weekend). Ten years later the patio still looks great. Karl and I are now working together again doing what we do best; ameliorating gardens. It gives me great pleasure to be working with Karl again. Working with people who truly love what they do makes all the difference in the world. 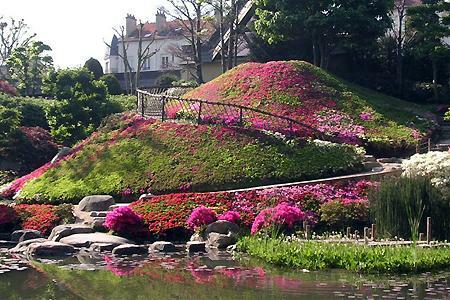 On April 4th, 2009 I gave a tour of the Albert Kahn Gardens in Boulogne, France, for the American Association of Wives of Europeans. 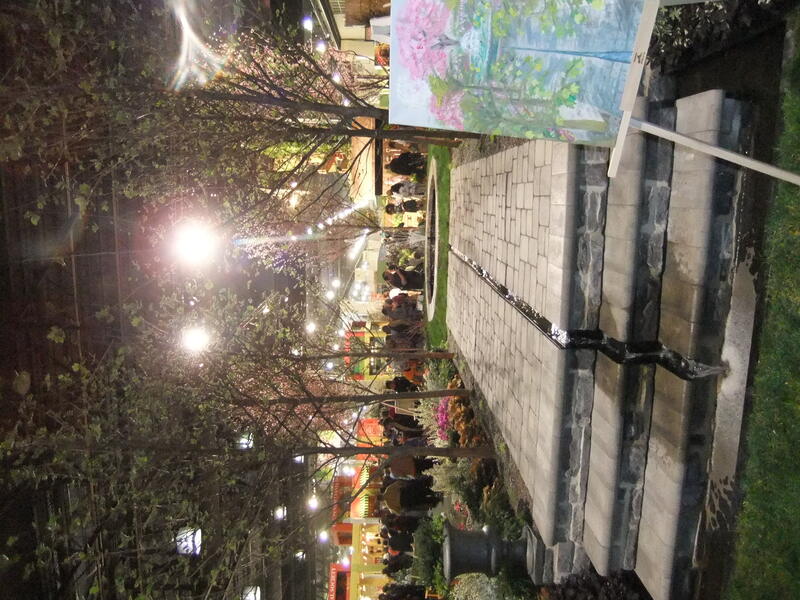 I was working as a Garden Designer at Caracterre, a small garden design company also in Boulogne, France. 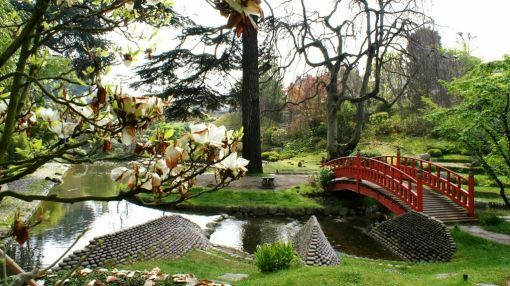 The Gardens of Albert Kahn Les Jardin d’Albert Kahn are located south west of Paris, easily accessible by the metro line 10 (last stop). Albert Kahn was born on March third in 1860 at Marmoutier in Alsace. This is where Kahn studied at the College de Severne from 1873 – 1876. At the age of six-teen, he moved to Paris where he finished his studies at the Ecole Normale Superierie. 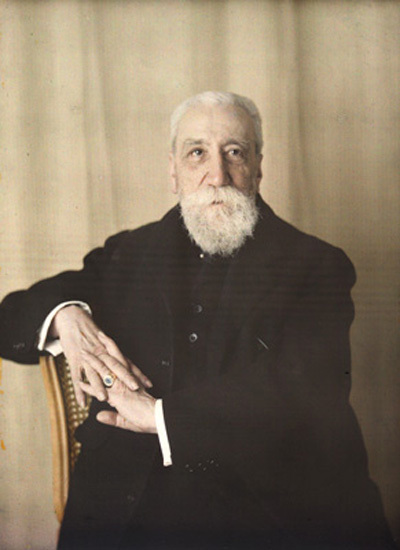 He also completed his baccalaurets de lettres in 1881, the Science in 1884, and then a license in law in 1885. He started working in a bank at Goudchaux at the age of twenty-one. In between 1889 – 1893 he started to make his fortune in diamonds and gold from South Africa. In 1893, he started his own bank, La Banque Kahn with other established financiers that worked in industry internationally noteworthy, Japan. 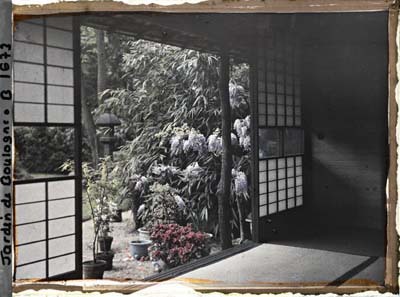 In between 1895 – 1910, Albert Kahn created an exceptional garden on four hectares of land. A garden that appreciates multiple worlds. Kahn traveled a lot to Japan, where it is believed he was inspired to create multiple scenes of landscapes on this in Boulogne-sur-Seine. He wanted to create a place that expressed the diversity of the planet; he dreamed of a world in peace. 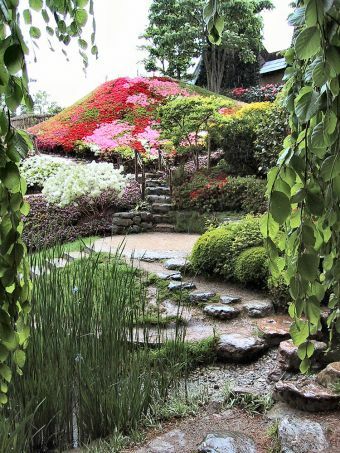 Today we will visit a constructed space in the form of a vegetable mosaic; a Japanese garden, French garden, English garden, Forest, prairies and swamps. These different garden scenes we will see create contrasts and surprises in the landscapes. These contrasts have been created delicately, there by always keeping the harmony of the space. Each one of the gardens constituents different horticultural worlds from different countries that express their own ideas through vegetation, structure, perspectives, and views. Inside of the Tea House, 1925. The original tea house was bigger with a straw roof. 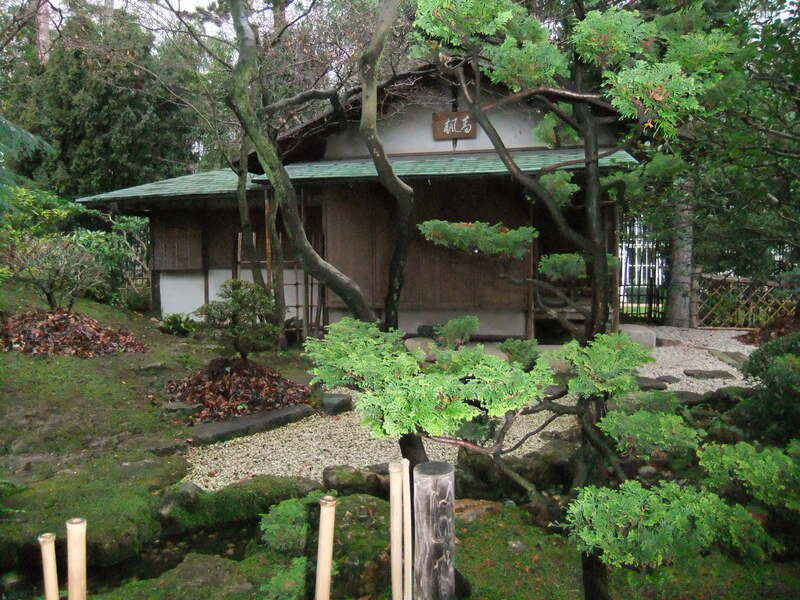 It was replaced by the Urasenke school of Kyoto in 1966 as a gift. The tea houses imitates more of the traditional style of a tea house; which is used as a place of retreat and meditation. The principal door opens on to the landscape, creating a link between civilization and nature. Originally, there was a pagoda of five floors on this site. Unfortunately it burnt down in 1952. A pagoda is a temple of five floors; each floor symbolizing the five elements of the earth; earth, water, fire, wind, and sky. Looking around the landscape, we can see highs and lows of vegetation; a mountain of Azaleas, which symbolizes Mont Fungi (the largest mountain in the world). 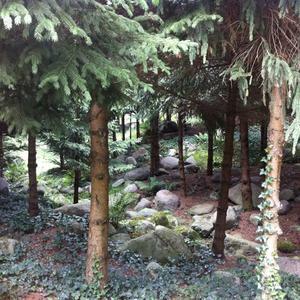 There is also imposing conifer’s that enclose the space, creating an intimate atmosphere. 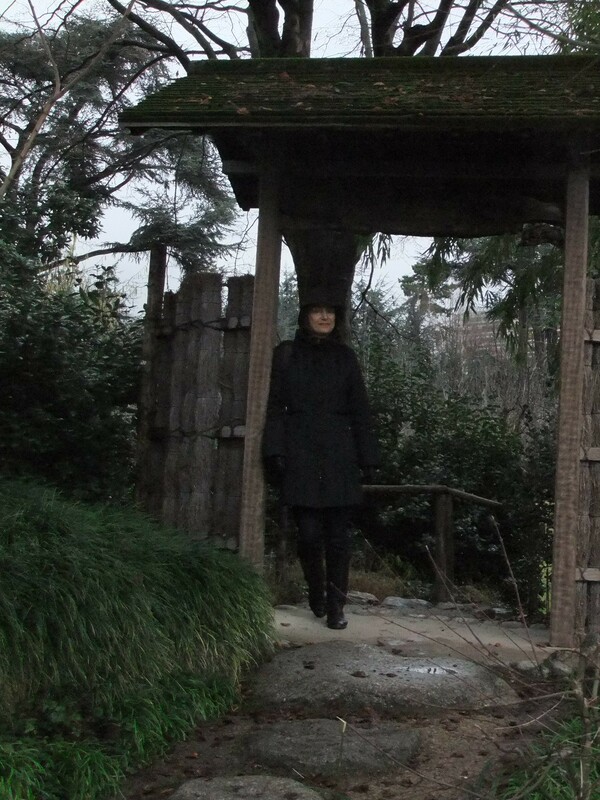 There are two things that make up a Japanese garden. The first objective is a garden with a collection of forms. Vegetation and other elements are used to imitate and symbolize these five elements of the earth artistically representative by the pagoda. The second objective is to create an illusion of a large landscape in a small space. There are several symbols in the village. 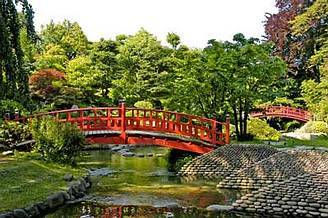 The red bridge was built after the famous red ‘Bridge of Serpents’ that connects Daiya and Nikko. Its red color suggests fire and creating contrast in the landscape. 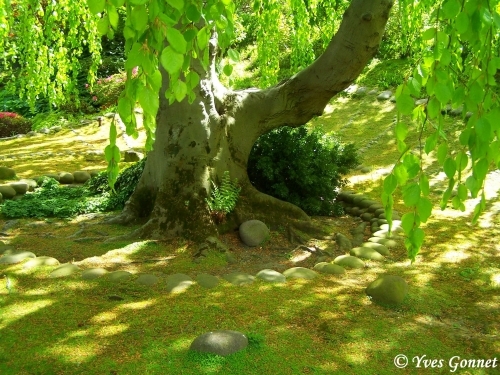 At the center of the garden determined by the Beech tree, marks the gardens axes. The Beech tree symbolizing femininity crosses axes with the Cedar, which symbolizes masculinity. The axle of death with is symbolized by the cone of stones, which point up to the sky. The mountain of Azaleas represents the plenitude, richness of the banker life. The axle of the river symbolizes life. The fortifications represent the ruptures of kahns life. Dominantly the wall street crash of 1929, which lead to Kahns decline in wealth. The fortifications represent pieces of the earth, mountains, cliffs after destruction from an earth quake. Finally, the inward spiral represents Kahn death in 1940. This currant of water that turns in a continuous spiral represents new cycles of life. The notion of eternal life that will forever transmit ideas and aspiration of Kahn dreams of a world in peace. 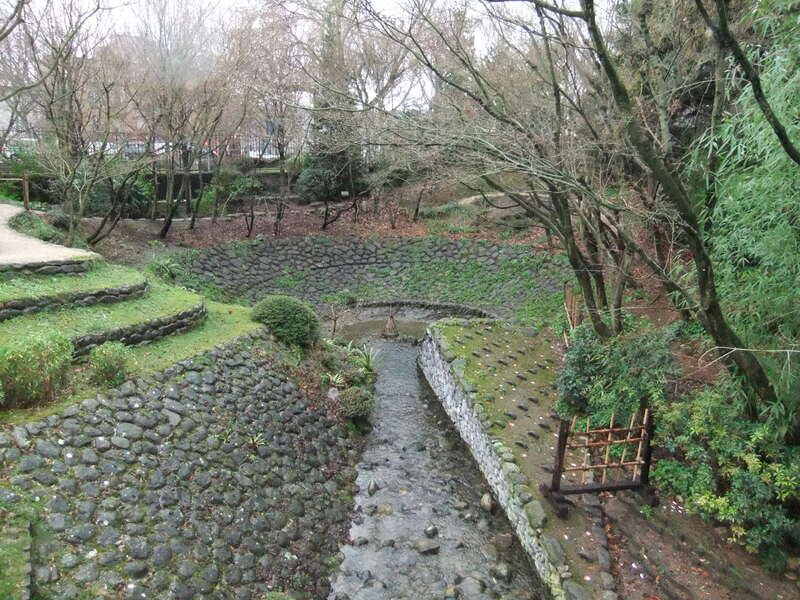 The Japanese garden section of Albert Kahn gardens, mixes tradition and modernity. It is traditional in its composition, representing mountains, water currant, waterfalls, and a terraced river. The modern elements are best represented by the sculptures of carved tile that can be seen through out the garden. They symbolize the sea, wind, and storms. The fortifications add a modern touch. The flags are representative of the link between Japan and France. Albert Kahn commissioned two famous landscape designers of the time Henri and Achille Duchen. They drew up the plans for the French garden and orchard/rose garden as a tribute to the french classical style of the 17th century, and the Renaissance. The French traditional style is regular, formal, symmetrical as represented here, but normally on a much larger scale. 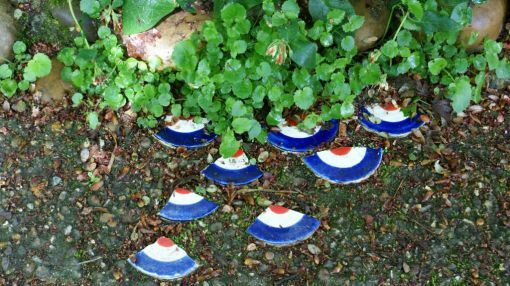 Though out time, the French have expressed an over all hostile attitude towards towards nature, which has influenced their conception for garden design. It is expressed in their way of cutting trees and shrubs. 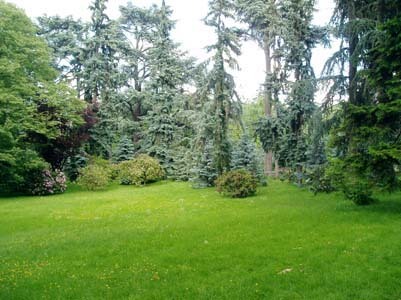 The French used their gardens to show their powers over nature by their desire to control and manipulate the nature. Traditional trees and shrubs were used as architectural elements often cut to form walls and arches (ie; the Garden at Versailles). 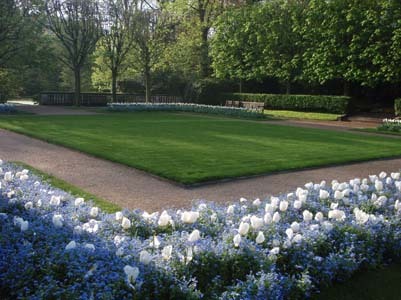 Their desire to control the nature is also expressed in their flower beds, used to create symmetry, and formality. When ‘new’ plants arrived in France from abroad they were planted in flower beds as objects in a museum. To show their splendor as they were plants in fashion, and new for the time. 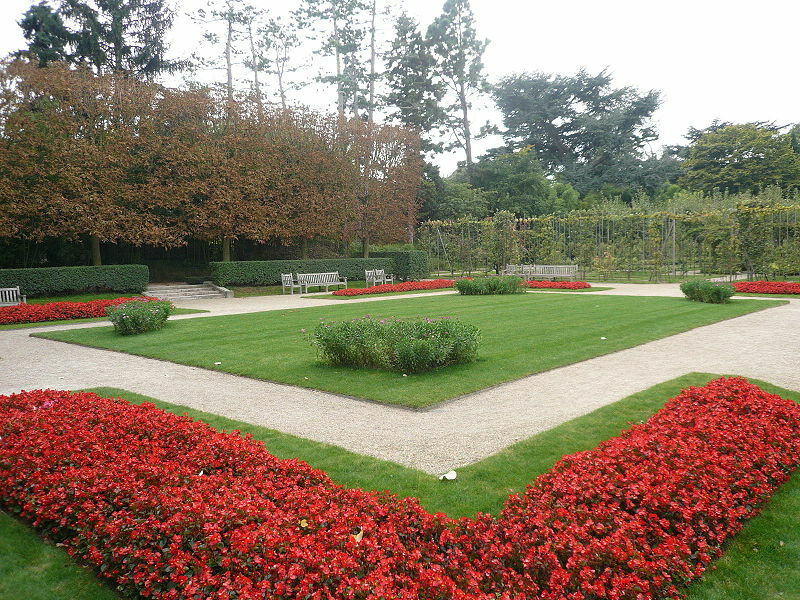 The French formality, regularity, and symmetrically is expressed here with its rectangular lawn, always cut short to create a smooth consistent surface. 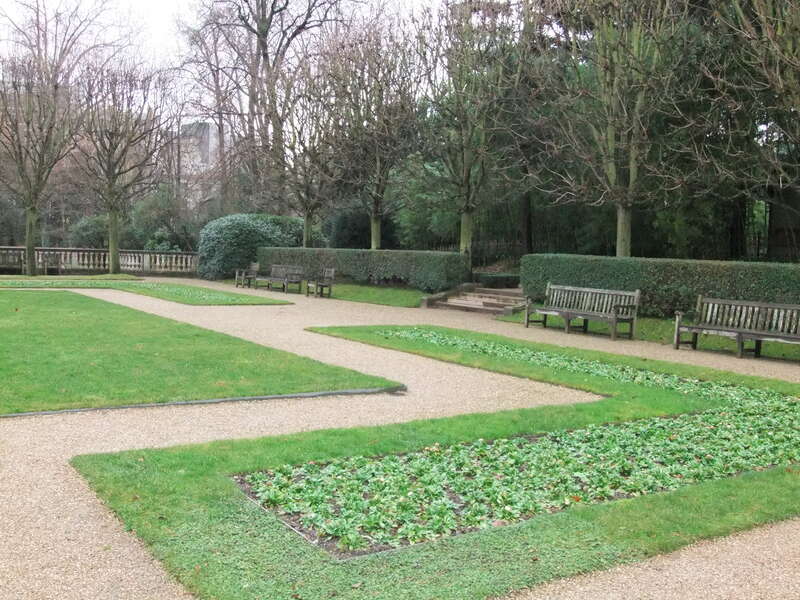 Around this central element of the space; there are four symmetric flower beds that enclose the space. 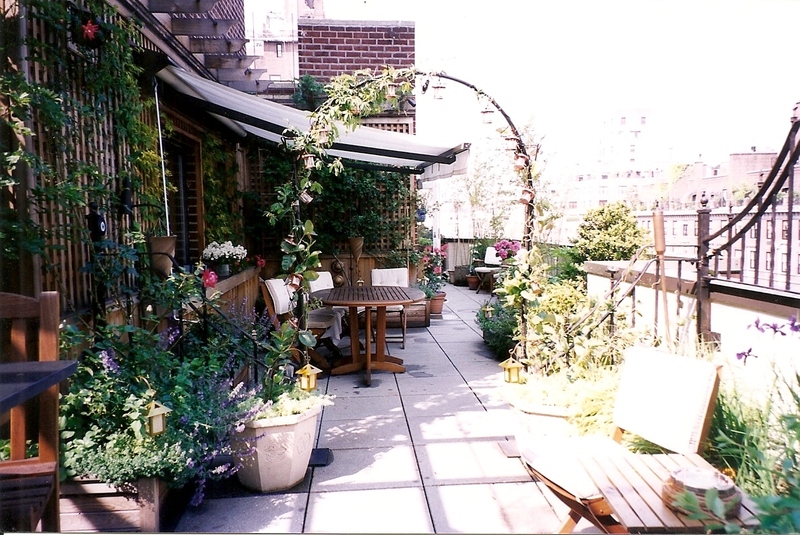 They are always planted with seasonal annuals of the same color that add to the consistency of the space. From autumn to spring; pansies, forget-me-knots, and tulips. Regularity, symmetry, geometry forms accentuates and dominates this landscaped scene with its adjacent short avenues of cut chestnut and lime trees. These trees have been traditionally a favorite in French gardens, used for creating long promenades witch can be seen all over France. As we move into the orchard, the visit quits its strict classical style, and becomes more spontaneous, keeping its classical lines remain dominant. Spontaneity is apparent by the pyramid’s, and sphere of different forms in the U and V shapes. These first four carres / squares are concerned with creating palmettes and forms with fruit trees of apple of pear. 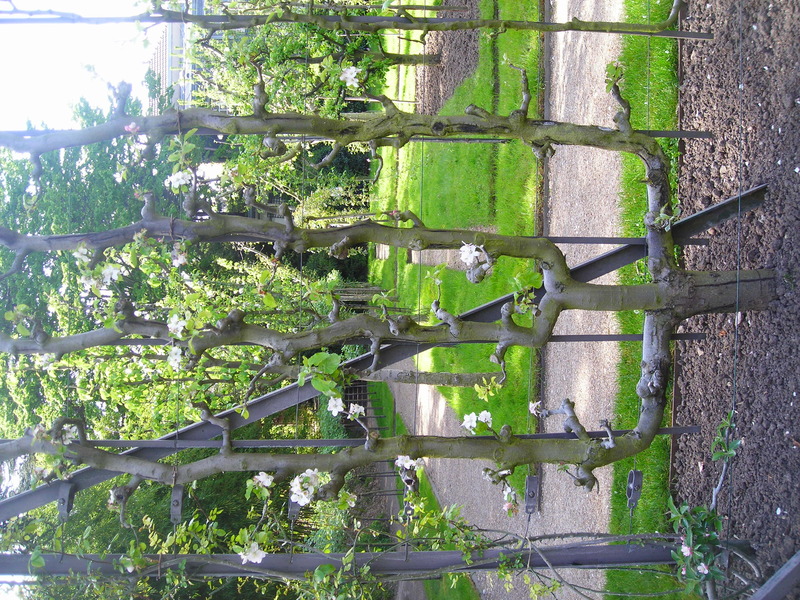 The second four carres / squares is part of the orchard is concerned with fruit trees. 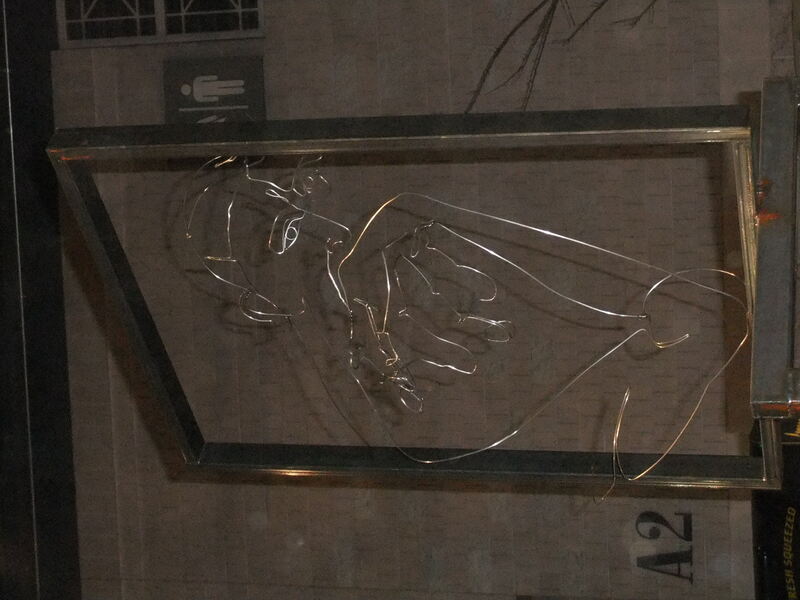 They are normally free flowing forms that add movement in the space by the wind. As the most ornamental time in the orchard is the spring and fall, the rose garden provides ornamental roses during the summer months. 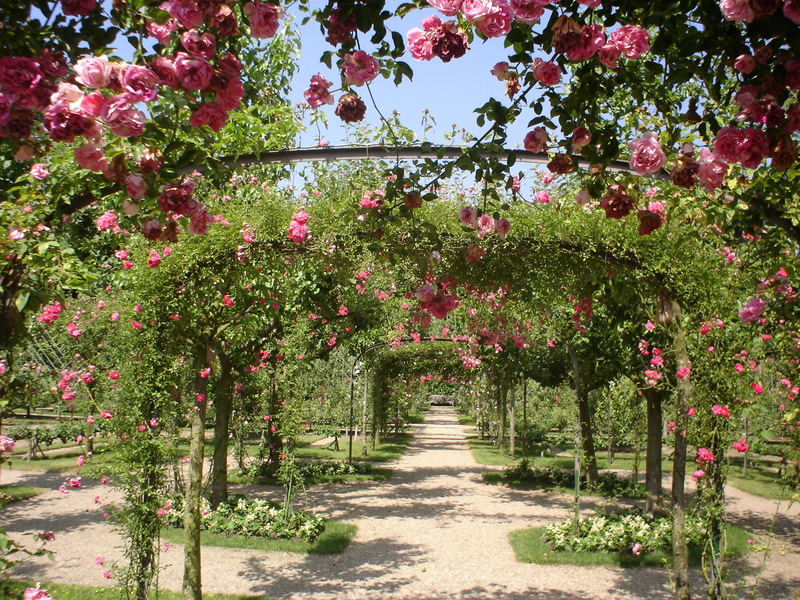 Albert Kahn specifically wanted a walking frame, a tunnel of arches of climbing roses for strolling. Creating a touch of the renaissance in a classical French garden. The addition of roses in the French garden is an Anglo-Saxon influence that arrived in France at the end of the 19th century. 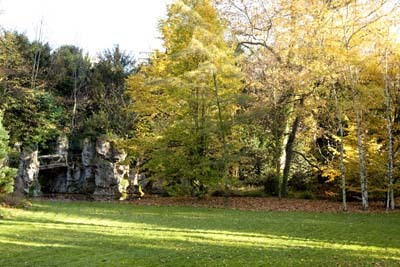 Kahn also created an English garden in this area. 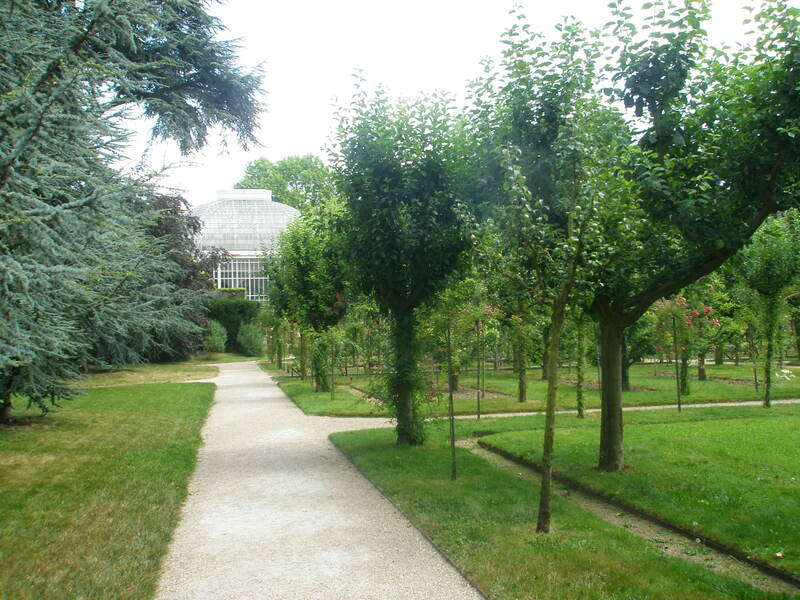 Looking in this direction; the perspective leads us to the English garden through this central promenade of the Orchard. There by connecting the French and English spaces. The regularity of the French gardens is contrasted here with the natural fashion of the English garden. However, this juxtaposition is not shocking for the visitor. Before England developed its own garden style, it was influenced by French, Italian, and Holland garden styles. 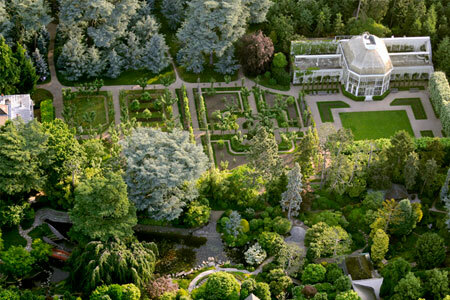 It was not until 1728, that the first garden plans expressing irregularity were introduced in English garden design. It is believed that the French formal style lost its popularity due to the war between the two countries. Irregularity is expressed here with the gardens small valley appearance with its curved lines. It is also expressed by the way the plants are planted and their abundance. During the spring the lawn accentuates a lot of attention by all the bulbs that are in bloom, such as daffodils, crocuses, narcissus and primroses. 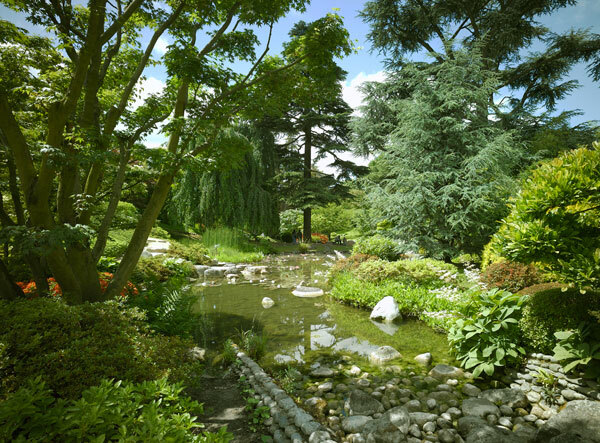 Along the lawn is a miniature river that meanders towards the rock garden / miniature cliff. Water is a very strong element here that invites the eyes an ears of the visitor to follow the rhythm of its succession. The free flowing English styles of how their vegetation is planted; plays with light and shadow. It is a characteristic that creates a natural landscape in a large or small scale. Kahn selected the trees because of their color in autumn. In autumn the garden is exuberant with yellow, gold, and brown by the Ginkgoes, Linden, Birch and Mable trees. 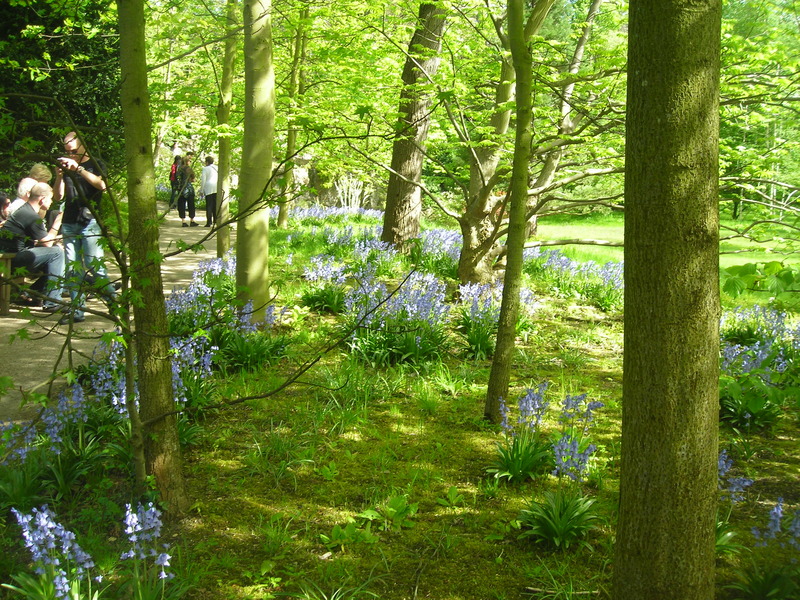 Through the English garden we enter the Blue Forest, it consists of a swamp and prarie. Kahn objective was to create surprises ans spontaneity in the landscape. All year round the forest is dense with the blue conifers, they are cedar of Colorado. In the spring there is a contrasts of color by the Rhododendrons and Azaleas. Originally the forest was dense before the storm of 1999. Many tall conifers fell to their deaths, we can easily see where they have been replaced. Kahn objective was to create a dense neutral forest to enter and get lost in. To the visitor wouldn’t have any reminders of the what country they were in. Kahn was inspired to create a wild prairie by the free flowing English style, to create contrast and harmonize with the different garden styles represented here. What is remarkable about the forest Vosgienne is that you really have the impression that you are in a real forest of a large scale, and not a small surface. Construction and plantation started here in 1902. Kahn wanted to create a forest that reminded him of his childhood, growing up in the region des Voges. Big blocks of granite and full grown trees were delivered here directly from des Vosges by wagon. When the trees arrived it was necessary to remove the electric cable wires in the area during their installation. These trees were Horn beams, Beech, chestnuts trees. On the forest floor, there is ivy, ferns, and seasonal digitalis. In the spring there are a lot of Narcissus to celebrate the traditional ‘Fete des joquilles’ party of daffodils, known in the Vosges. The big blocks of granite are planted here in the manner to evoke the environment on top of the mountains of des Voges. In the center, there is a dry river, common to find in the region as well. 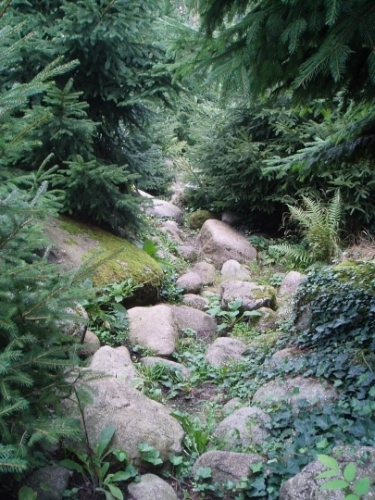 The region Vosges is the principal influence in the creation of the garden, but the forest of Alsace also plays it part. Kahn objective was to create a sentiment of solitude …. of peace known in big forests all over the world. After the storm of 1999, a lot of trees were destroyed and had to be replaced. Archives of 1910 through 1950 were used for the restoration of the space. The restoration took two years between 2000 -2002. A large group of professional of engineers, gardeners, landscape architects, and hydrolyze engineers lead the restoration. First they had to evacuate 650 fallen trees, leval the ground, and remove 150 tonnes of debris. With a lot of hard work and skills used …. we can still today appreciate the atmosphere that existed before the storm. 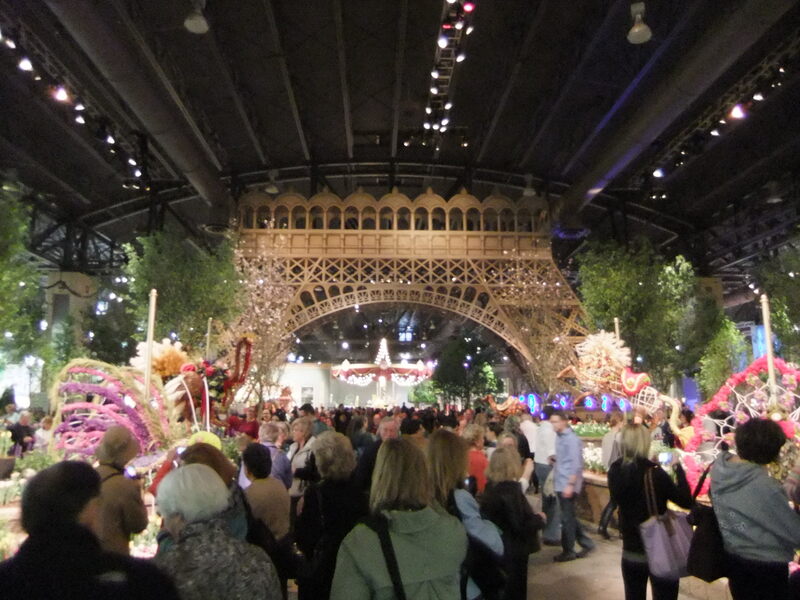 The Horticulture Society of Philadelphia theme for 2011 Flower Show was “Springtime in Paris” at the Philadelphia Convention Center. It was open to the public from March 6 – 13, 2011. 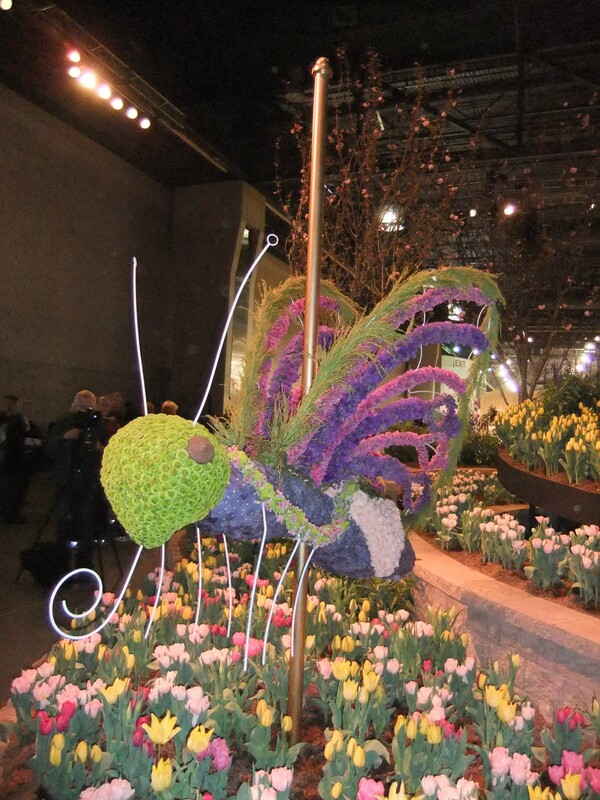 Every year Floral and Garden Designers participate in a competition based on that year’s theme by creating a garden or floral display. 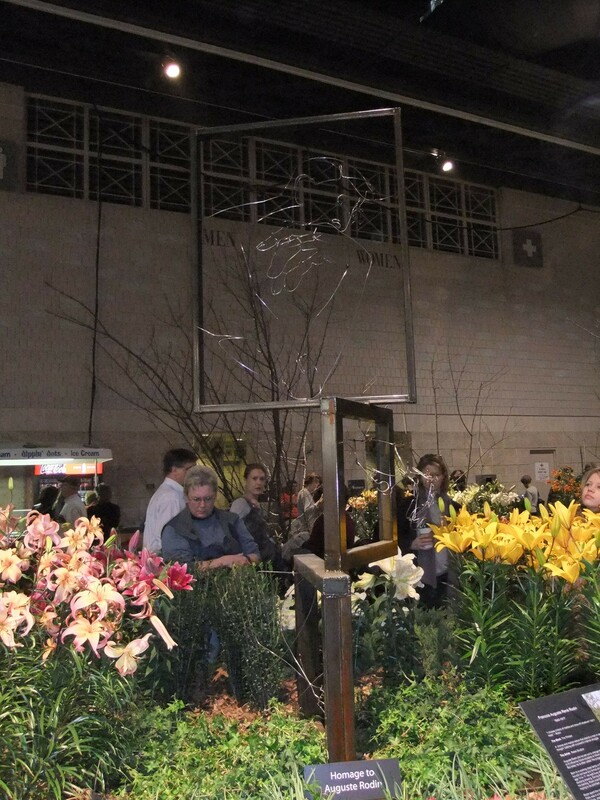 Designers are showing their vast knowledge in the subject and talent through their exuberant displays. 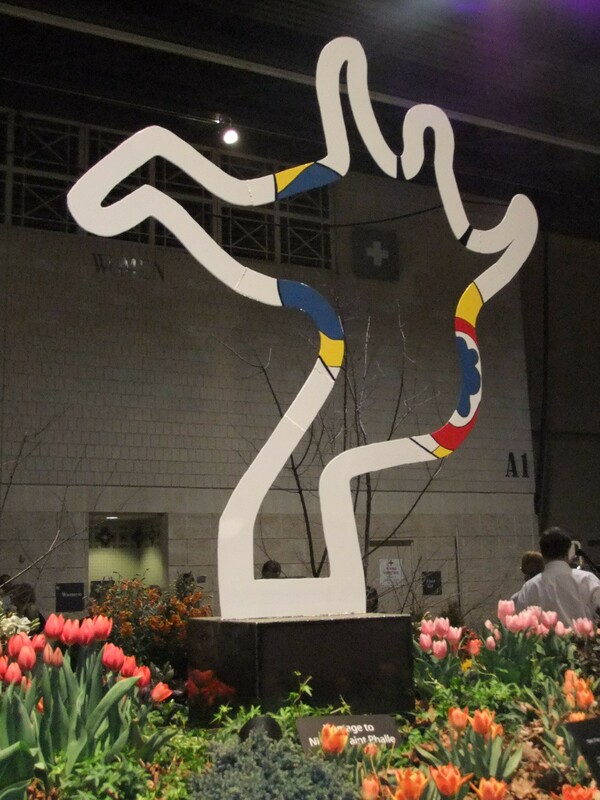 When one entered the convention center, they are immediately struck by a 37 foot tall, and 75 foot wide Eiffel Tower. It is even covered with over 1000 lights and periodically lights up and dances very much like what the real Eiffel Tower does in Paris ever since 2000. 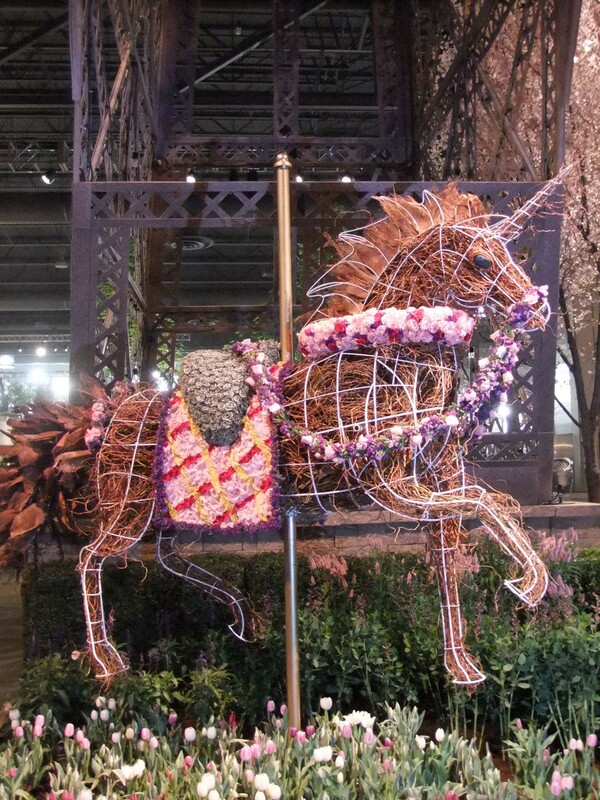 Visitors are impressed right away by a walkway a lined with flower stuffed animals leading up to a Carousel. Valley Forge Flowers exhibits a stunning display of Peacocks, Bumble Bee, Ostrich, Lion, and a Unicorn. One of France’s distinct French Garden/Park Formal elements is their rectangular Beech/Linden tree shaped allies. These rectangular tree hedges can be seen all over France. They need to be pruned three times a year and are very labor intensive. 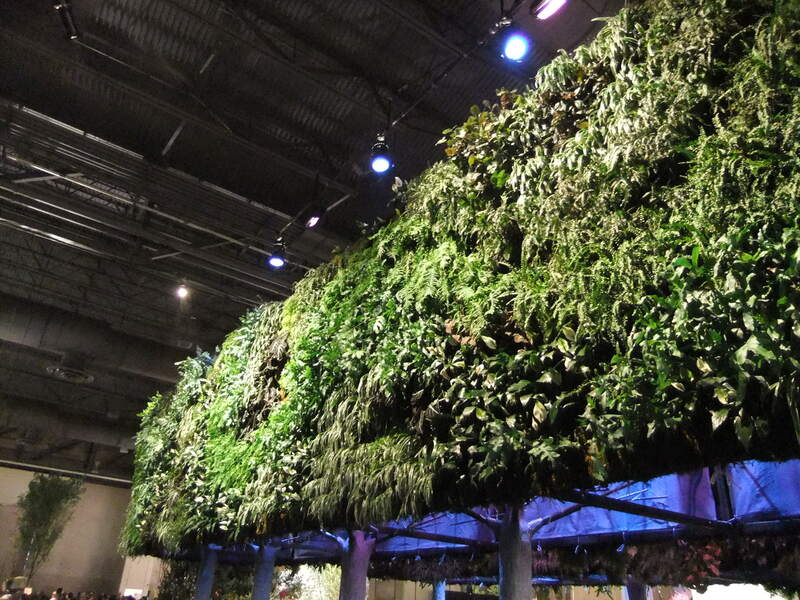 The exhibit by Groundswell Design Group entitled, ‘Monet’s Allee’ displays this traditional French element with the use of an elaborate green wall. The visitor was invited to pass between rows of false trees with stainless steal sculptures holding a canopy of a green living wall. The bases of the trees are situated in shallow pools of water. The branches of the false trees release a light shower into the pools. 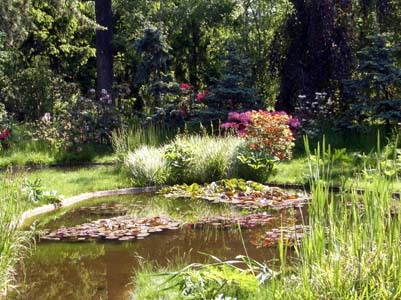 The use of the water feature is inspired by the gardens at Giverny, Monets gardens north of Paris. Of all the wonderful exhibits, the one that was the most creative and inspiring was ‘An American in Paris’ by Schaffer Designs. 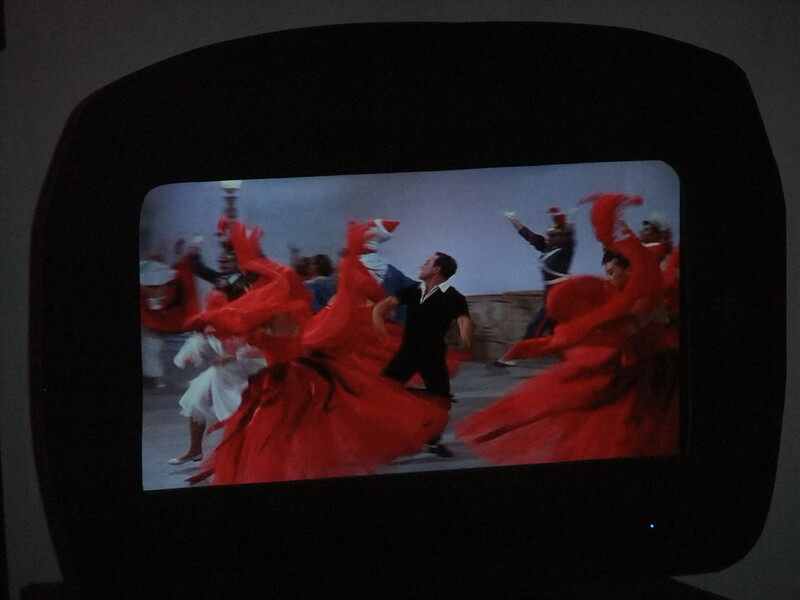 It displayed four scenes inspired by the Musical “An American in Paris” celebrating its 60th Anniversary. 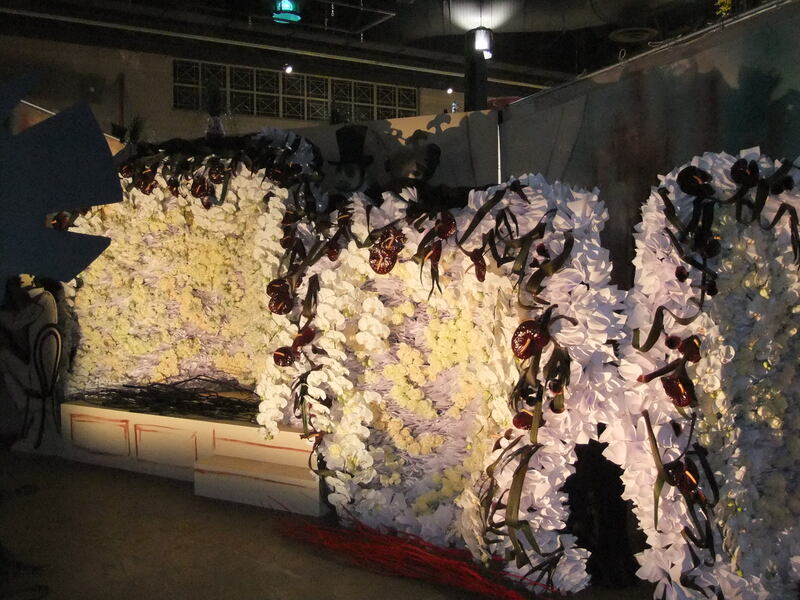 The floral displays are set up on mimicked movie sets, with television sets showing the scenes of the movie that inspired each display. 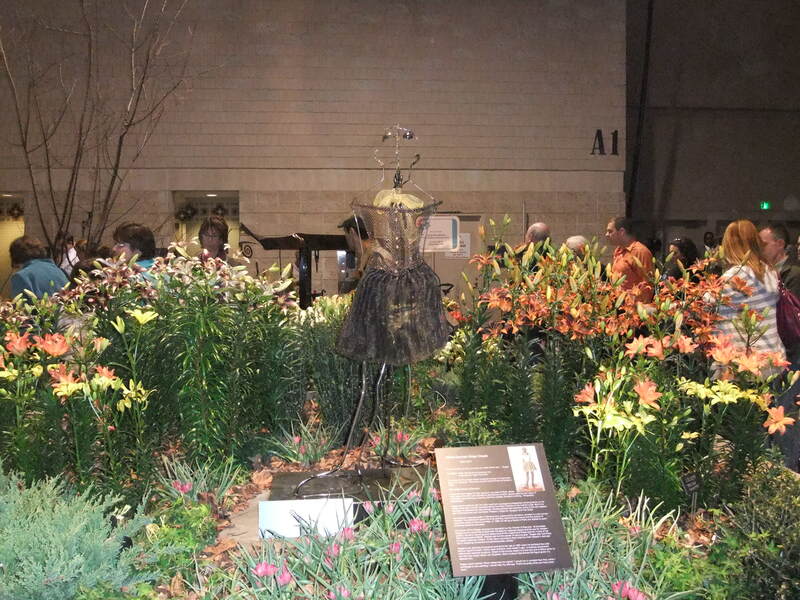 Schaffer Designs won best achievement in Incorporation of Rhythm in Floral Display. Garlands of yellow orchids were used with bouquets of red roses, and spiraling bouquets of green leaves were used to create the illusion of movement. The most touching exhibit to the heart with out doubt was ‘Musee de l’Espirt by Jacques Amand, the bulb specialist. He paid homage to French Artists in a bulb-filled French Sculpture Garden. Such as Sculptor Auguste Rodin, Dance Choreographer Edgar Degas, Surrealism Sculptor Francoi-Xavier Lalanne, Sculptor, painter & Film Maker Niki de Saint Phalle, and Artist & Sculptor Louise Josephine Bourgeois. 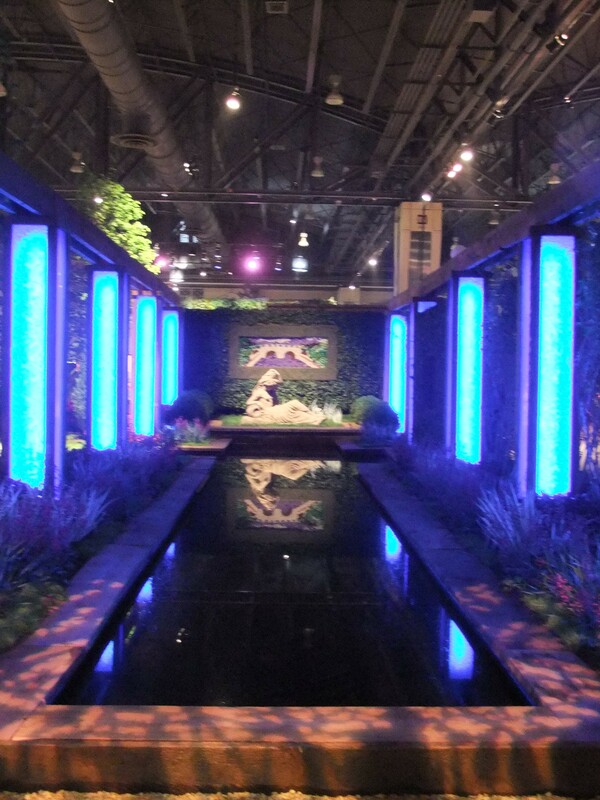 Jacques Amand won Best Achievement bulb-filled French Sculpture Garden. 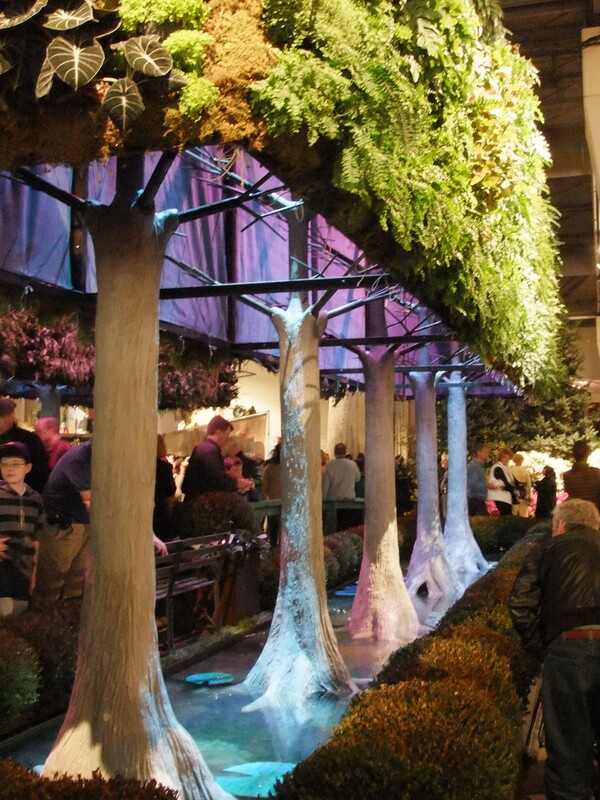 The exhibit entitled ‘En Plein Air’ by Hunter Hayes Landscape Design is the only French garden display with exterior influence. The water feature displayed here is an Arabic Garden element as seen in the Gardens in the South of Spain. 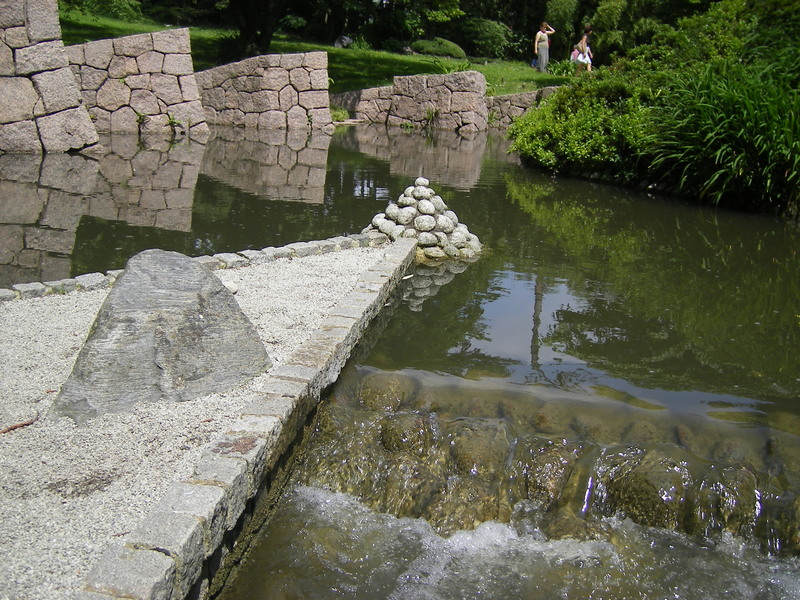 A thin stream of water leading to a fountain with a water jet, usually lined with trees. This Arabic water element is combined with a classical French Formal Garden setting. 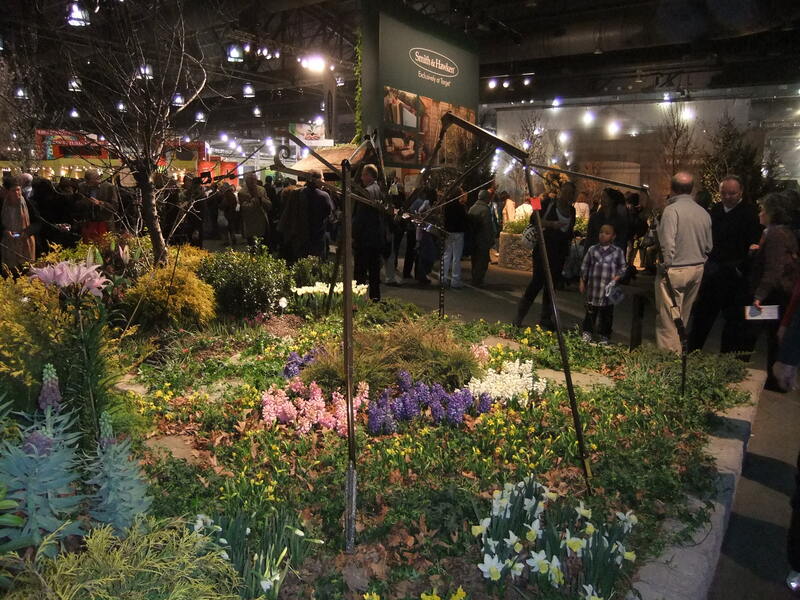 The display that best exhibited its influence was ‘Timeless Paris’ by Burke Brothers Landscape Contractors. This display was inspired by the Gardens at Versailles. In the garden at Versailles there is a large water basin that disappears into the horizon. Burke Brothers managed to imitate this large perspective in a miniature scale. At the end of their water basin is a sculpture of a naked woman very similar to those found around the castle of Versailles. 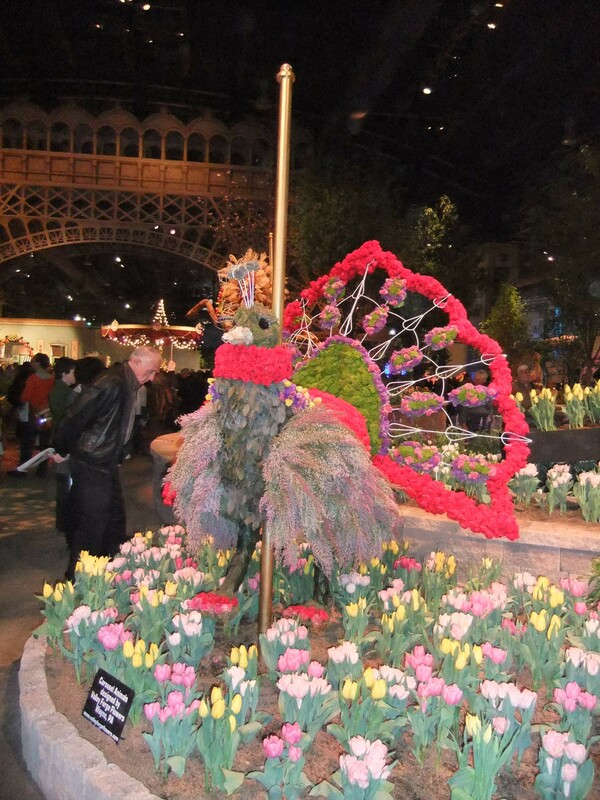 This display won Best Achievement in Creating a Dramatic French Garden. This blog is a collection of reviews/articles about gardens (or shows) that I have visited in France and the United States. 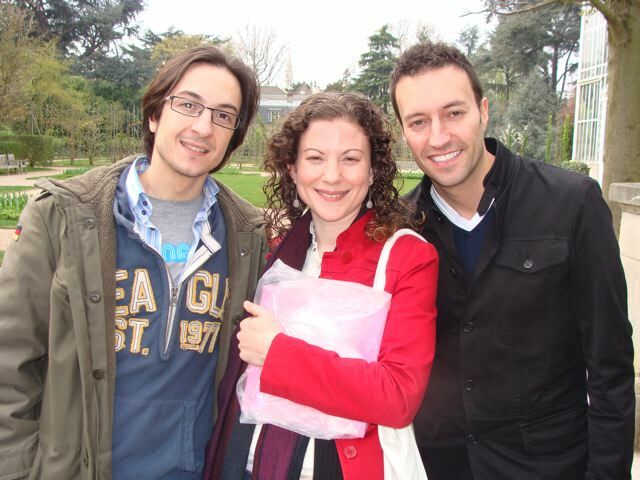 During my eight years of living in Paris, France, I had the opportunity to visit numerous gardens in and around Paris. 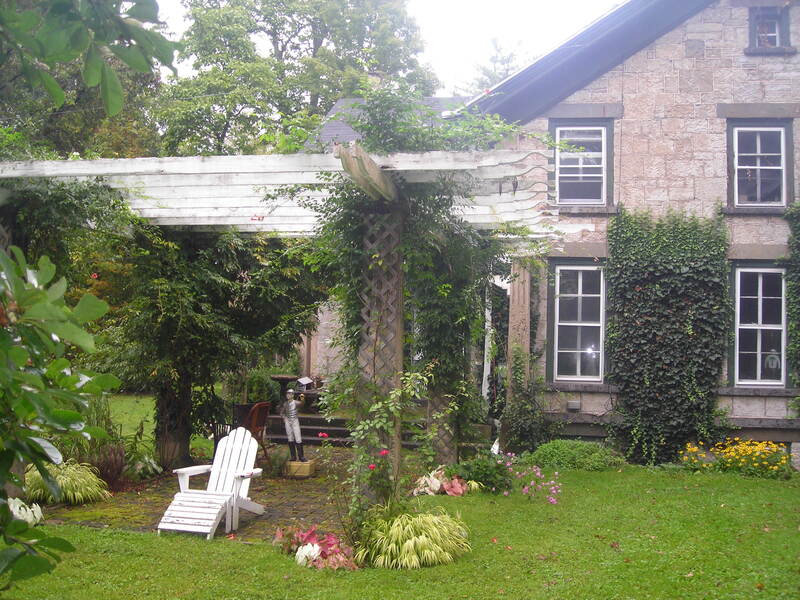 This blog is for anyone who wishes to know more about gardens in our country and beyond.